Herbine's diverse programming offers flexible accompaniment - guitar, harp, piano or strings. From my Festival of New American Music full piccolo and piano recital, sponsored in part by Powell Flutes. Lois Bliss Herbine, piccolo Jooyoung Kim, piano. Sacramento State University, November 7, 2017. "The High and the Mighty" for piccolo and piano by Michael Daugherty was Composed in 2000 in celebration of the life of my piccolo teacher, John C. Krell 1914 - 1999. Philadelphia Harp Music Festival final concert held at the Church of St. Luke and the Epiphany, Philadelphia on October 10, 2010. Performed by Lois Bliss Herbine (flute), Susan Arnold (viola), and Erica Goodman (harp). In 2005 Lois Herbine gave her first Bliss and Friends concert on the Concerts at Carmel series with the Wister String Quartet (Nancy Bean and David Booth violins, Pamela Fay viola and Lloyd Smith cello). This paved the way for the annual program. Artists such as classical/ jazz violinist Diane Monroe, harpist Sophie Bruno Labiner, guitarist Allen Krantz, pianist Charles Abramovic, clarinetist Arne Running soprano Janice Fiore and cellist James Cooper, III are the friends performing with Herbine on standard repertoire as well as world premieres. LOIS HERBINE was THE FOUNDER AND ARTISTIC DIRECTOR OF CONCERTS AT CARMEL, A CLASSICAL CHAMBER MUSIC SERIES IN SUBURBAN PHILADELPHIA presenting TWO CHAMBER CONCERTS, AN ORGAN RECITAL AND AN INTERACTIVE CHILDREN'S CONCERT ANNUALLY IN THE SANCTUARY OF CARMEL PRESBYTERIAN CHURCH FROM 1999 TO 2009. For their tenth anniversary and final season, a celebratory CD with concert highlights was released and received favorable press. "This CD, one hopes, will serve to further increase the visibility of Concerts at Carmel, which has just completed its tenth season at Glenside's Carmel Presbyterian Church. The four live performances offered here - three from the 2006-2007 season and one, from 2000 - well represent the breadth of repertoire and high level of musicianship that characterize the Montgomery County concert series. The program is framed by two short organ selections - Carmel's instrument is a favorite of area organists - played by a familiar experienced artist and a young phenom. Michael Stairs, organist for the Philadelphia Orchestra and a respected choral conductor, performs Daniel Barta's Toccata Joyous, composed for the inauguration of a new organ installed at the Reformed Church in Willow Grove, PA... Stairs dispatches it confidently; an effective curtain raiser. The CD concludes with the glorious third movement of Oliver Messiaen's L'Ascension... Chicago-born Nathan Laube came to the Curtis Institute at age 15 and, though still a student there, maintains a busy performing schedule. His reading of Messiaen may not be as grandly Gothic as some others, but the young player is firmly in control of the technical challenges of the piece, providing an ecstatic conclusion to the CD. There's not a musician appearing on this program who isn't operating at the highest level, but the stars of the show are the two woodwind players. Ricardo Morales, principal clarinetist for the Philadelphia Orchestra since 2002 (he held the same position at the Metropolitan Opera previously) is joined by the four Orchestra members comprising the Wistar Quartet for a luminous performance of Brahms' Op. 115 Clarinet Quintet. Morales possesses a warm and even tone, a fluent technique, and sure musical instincts. The second movement Adagio features one of those lovely Brahms melodies that's at once tender and noble: Morales spins out seemingly endless, perfectly shaped lines to create a meltingly beautiful reverie. Interpretively, the Wistar is with him every step of the way. For Illuminations, from which the CD gets its title, St. Louis-based composer Stephen Mager sets texts drawn from 14th to 16th century Middle English sources, including Chaucer and Charles d'Orleans. The composer describes his song as "a series of musical tableaux suggesting the lavish illustrations of medieval manuscripts" and the harp part, neatly executed by Sophie Bruno Labiner, creates an apt lute-like sonority. Soprano Janice Fiore has extensive experience with new music, having participated in over thirty first performances, and she's clearly comfortable with the composer's idiom. Fiore never overwhelms these small pieces, scaling her voice back for the intimately communicative lyrics. Lois Bliss Herbine's piccolo is a second vocal participant, intertwining her song-like lines around the soprano's. Herbine produces a full and richly colored tone on her tiny instrument that, in lesser hands, can become wearyingly fife-like. A lighter-than-air Saltarello movement for piccolo and harp alone gives center stage to Herbine's virtuosity as she effortlessly shifts between passages of flutter- tonguing and regular articulation in the course of the movement... aurally as well as musically, this release is a winner - one that should get all of us to Glenside for Concerts at Carmel's 11th season." 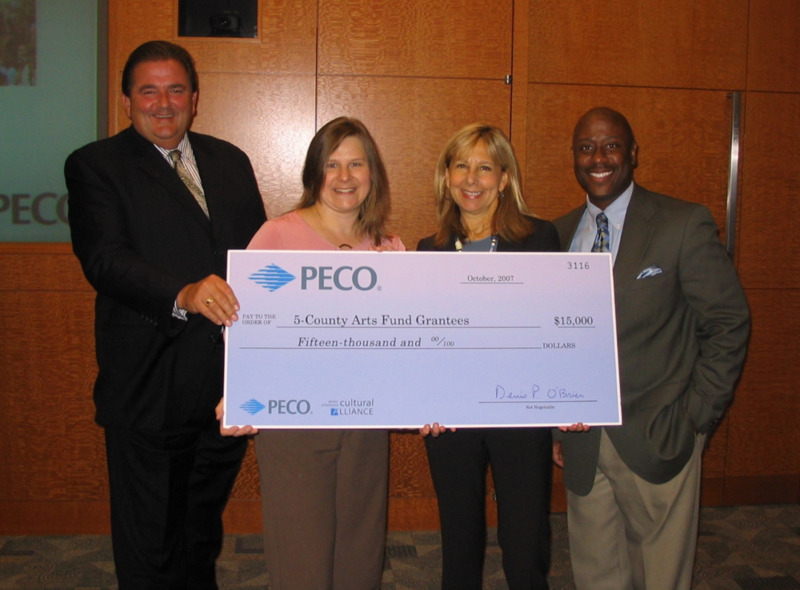 Concerts at Carmel received 5- County Arts Fund Grant for three years running which became a Project Stream grant from the Pennsylvania Council on the Arts. Concerts and Caramel: Illuminations. Michael Stairs and Nathan Laube, organ; Ricardo Morales, clarinet; the Wister Quartet (Nancy Bean, Davyd Booth, violins; Pamela Fay, viola; Lloyd Smith, cello); Janice Fiore, soprano; Lois Bliss Herbine, piccolo; Sophie Bruno Labiner, harp. Recorded live at Carmel Presbyterian Church, Glenside, Pa. DTR/Direct-to-Tape Recording Co. DTR6050. "...All of the performers here are first-rate; the live performances are highly satisfying. The Tocata Joyeuse (1993) of Daniel Barta is a well-structured multisectional work for organ, contrasting lyricism with pyrotechnics, tellingly performed here by Michael Stairs. Johannes Brahms’s late, ravishingly beautiful Quartet in B Minor, Op. 115, for clarinet and string quartet receives a warm, sensitive, engaging, and elegant reading by Mr. Morales and the Wister Quartet. Perhaps the most intriguing work on the program is Illuminations, a song cycle for soprano, piccolo and harp (2001) by Stephen Mager. The six pieces of the cycle are settings of medieval manuscripts in Middle English and French touching on themes of love, absence, loss and resignation. The music combines medieval forms, rhythms, and melodic formulas with pleasantly modern harmonies, including polytonality. The three performers demonstrate loving and confident commitment to the score in this alluring performance. Organist Nathan Laube concludes the program with a brilliant performance of Messiaen’s “Transports de joie” from L’Ascension. Philadelphians have good reason to be proud of this distinguished series and the artistic excellence it represents." "The other discs are most notable for their individual participants. The Kennedy Center's is masterminded by pianist Lambert Orkis, whose restless intelligence always commands attention... Among clarinetists, the Philadelphia Orchestra's Ricardo Morales (heard with the excellent Wister Quartet) is in a class by himself... the piccolo and harp contributions by Lois Bliss Herbine and Sophie Bruno Labiner are models of color-driven expression." If you would like to be notified about future "Bliss and Friends" concerts, please fill out an email subscription form found on the contact page.